Why is bullying such a problem these days? Categories: Childhood Disorders, Children, Family, Mental Health, Parenting, Personal Growth, School, and Stress. Bullying occurs when one person (or group of people) in a position of power deliberately intimidates, abuses, or coerces an individual with the intention to hurt that person physically or emotionally. Its a pattern of aggressive behavior that can be physical or verbal. Bullying has been around ever since school yards existed. Why is it now such a problem that our national conscience pays attention to it? We didn’t have “Anti-bullying” programs when I was in school, but I know for sure that bullying was happening when I was a student. It was just part of school life. I believe we are paying more attention to it for at least two reasons. The first is that students are reacting to bullying much more violently than in the past. According to USA Today, there have been 25 fatal school shootings since the infamous Columbine shooting in 1999. In the last 30 years, the suicide rate among middle-school age children has increased 50%, as reported by The American Association of Suicidology. There is a clear increase in violence towards others and towards one’s self as a reaction to social rejection and bullying. Why the strong reaction? I believe thats related to the second reason bullying is a rising concern: The social media effect. When reading stories and reports about bullying and its violent result, there is a strong connection to the influence of social media. Social media, (i.e., Instagram, SnapChat, and Twitter) is a major part of a teenager’s social world. It is also the realm of cyber-bullying: the act of intimidating, shaming and socially ostracizing someone online. Online bullying can be done through pictures, written word or videos. Before social media, kids could leave the harassing experience behind on the school grounds. Now, they obsessively pay attention to it all day and night. In their attempts to find and maintain friendships online, there is no escape from the bully. 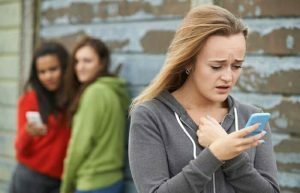 A common way this bullying occurs, especially among girls, is the posting of a picture on Instagram in which several girls are tagged as present and the girl who was purposefully left out is also tagged – thereby giving the clear message that she was intentionally rejected by the friend group. That is mild bullying compared to the actively hostile slandering, harassment and gossiping that occurs on social media. What should we parents do to help “bully-proof” our children? We could become overprotective, but then the question is do you want your children to be safe or to be strong? There’s a reasonable balance that must be struck. There are three tips I have for helping make our children safer and stronger against the cruelty of others. Help your child be very picky about whose opinion matters in their life. There should only be a small handful of people that your child cares what they think of him or her. These should be people that the child absolutely knows and trusts that they want what is best for them. It is also important to teach your child that how people treat her has little to do with her and instead is about the nature of the other person. In other words, haters will be haters. We have to learn to guard ourselves and not let people who don’t even really know us have access to our self-esteem. Have boundaries with social media. Regularly check who your children are interacting with online; who they are following and who is following (or friends with) them. Help your child learn to take healthy breaks from social media. Andy Crouch, author of “The Tech-Wise Family” suggests that we purposefully become “tech free” one hour a day, one day a week, and one week a year. In addition to this, PLEASE make a rule that your children turn in their phones (and other devices with which they can access social media) to you every night. Research shows that the majority of teens really can’t handle 24 hour access because its too addictive. Remember the power of two. Research shows that when one person stands up for a victim of bullying, the incidence of bullying decreases by 60% for that person. Bullies are focused on power. A victim whose friend stands with him takes away the bully’s power. When someone stands up for the bullied person by just saying something like “Hey that’s not cool”, it often dramatically defuses the situation immediately. Want more advice about Childhood Disorders?